Maybe your heroes need an island holiday? 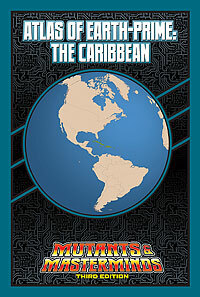 Too bad, since they’ll find plenty to do as the Atlas of Earth-Prime takes us to the Caribbean! It is the center for a secret spiritual war between the Loa, the powerful spirits of Voodoo, and stronghold of Siren’s arch-foe Baron Samedi. Go up against the Jamaican posse run by the Snowman or help local heroes Coral and Hurican fight criminals and natural disasters. Explore the mysteries deep in the heart of the Bermuda Triangle, and visit the fantastic Utopia Isle and its inhabitants. Much more than just a "day at the beach"!